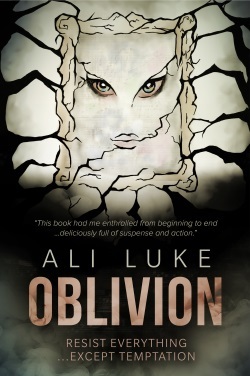 Oblivion, the second book in the Lycopolis trilogy, is now available. Hurrah! It’s currently only out as a Kindle ebook, but I’ll be creating versions for other e-stores soon, and hope to make a paperback version available as well. In the English countryside, Seth’s settling into his new house – a striking contrast with his home in London. Over in Swindon, Mark and Hannah are coming to terms with family upheaval. In Oxford, Kay and Brandon are trying to focus on their studies – yet the demon world is becoming a hard-to-ignore reality. Seth’s new house harbours an old secret, one that’s set to rock Mark and Hannah’s already shaky marriage … despite their determination to have nothing more to do with him. An empty picture frame, a dark snowy night, and the gift of a thousand pounds open up a dangerous path for fresh temptation and ancient evil to combine. If you follow my blog Aliventures too, you’ll probably know the reasons for the four year wait: my two young children, Kitty (who will turn three in March) and Nick (who was one on Christmas Eve). They are a delight, but a time-consuming one! My novel writing is becoming ever more efficient, however, and I have no plans for more pregnancies and babies … so I hope to have the third and final volume of the trilogy completed and published by the end of 2017. To make sure you hear about it as soon as it’s ready, join the email list by popping your name and address in below. (I would never spam you or sell your email address … you’ll only hear Lycopolis-related news from me). One of the key challenges in writing Lycopolis was how to represent the game world within the novel. The game isn’t just a plot device: it’s also a way in which I explore the nature of storytelling and imagination. I wanted to convey something of the feeling of taking part in a roleplaying game, and I also wanted the game sections to feel at least somewhat “real” – as though the in-game characters had lives of their own too. The main issue I have is that the character Seth is the world creator and apparently the only storyteller of the game. How can he be everywhere at once and available whenever people want to be on? How does the game progress a story without him? How was Kay able to do an activity in-game without him? How would it be programmed in? Seth, being Seth, is pretty controlling of the story. Anything really major that happens is planned by him (quite probably with help from Kay and others – that’s why in the opening scene of Lycopolis, he’s trying to pressure Kay into her help with the demon-summoning roleplay). But the more peripheral aspects of the story are player-led; Tristram’s interaction with his squire, Benedict, for instance, doesn’t need Seth’s involvement. I was really keen on this, because I don’t think graphical roleplaying games have anything like the same immersive power … but it caused a lot of initial confusion with my workshop group, most of whom weren’t gamers or internetty types, and assumed that “game” = “graphical”. I didn’t want to relay the game story like a MUD log file – line after line of text, transcribed as it would actually take place – because I know from my own gaming days that these are a lot more fun to take part in, in real time, than to read afterwards. “I have deep misgivings about this.” Sir Tristram strode over to where Lord Cyrric stood, in the doorway leading down to the Temple of Shadows. She should not see such things. No-one should. There were louder footsteps now, accompanied by a jangling of metal, then a whooping battle-cry. Matilda. She came over, dragging a chained slave girl no older than Tristram’s squire. “Stay and join us,” Cyrric said, to Matilda. The parts I’ve put in bold are ones that are explicitly from Tristram’s viewpoint. The other players wouldn’t necessarily have any idea of what he’s thinking (though it does influence how he behaves – so Kay needs to know). I realise this may well be confusing to readers who are expecting the game to be more of a log of events, rather than the interpretation of the gameplay through a player’s eyes. The line in bold italics indicates that the scene is through Tristram’s perspective (and thus Kay’s). The line in bold underlined italics is Tristram’s (Kay’s) observation – it’s a comparison that others could easily have made, but probably wouldn’t. I did this deliberately. (Well, mostly. It’s always hard to be sure after the fact how much was deliberate and how much just happened to get written that way…) The in-game scenes don’t just show the action, they show what a character’s player is adding to this in their own imagination (e.g. Tristram’s hope that Matilda will refuse Cyrric’s invitation). There are other ways I could written the in-game scenes, of course. Very early on in the drafting, I tried merging in-game and out-of-game (so that you saw people’s thoughts as they played) – it quickly became obvious that this wasn’t going to work too well. I could have written the game narrative from an omniscient, rather than a limited third-person, perspective – and while that might have resolved some of the objections that readers have had, it would have given the book a different flavour. If you’ve read Lycopolis, I’d love to hear what you thought about the in-game scenes. Did they work for you? Were you distracted by trying to work out what the stories equated to in terms of what each player was typing, or did that not bother you? 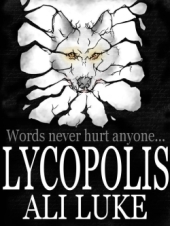 Quick annoucement: Lycopolis is now available in ebook AND paperback from both Amazon.com and Amazon.co.uk. During April and May, I went on a virtual book tour … lots of fun, and no travelling involved! I “stopped” at a bunch of different blogs to share my tips on different aspects of writing, blogging, and self-publishing. Huge thanks to all my wonderful hosts. Every blog listed here is well worth checking out! And if you’re looking for help with publishing or marketing your own book, take a look at Book Baby for self-publishing services and the Author Marketing Club for free Book Marketing Tips and Resources for Authors. Pop your email address in below to get Lycopolis-related updates straight to your inbox.